ALAMO, TN (MAY, 2018) – Southern Pride BBQ Pits and Smokers, the leader in the commercial smoker industry, is pleased to announce they have officially received Patent 9,930,897 from the United State Patent and Trademark Office for the airflow technology in the gas-fired, wood burning, stationary rack smoker, the SRG-400. This technology has also received Patent 2,986,130 in Europe, Patent 61/993,104 in Australia, and patents are pending in Canada and New Zealand. 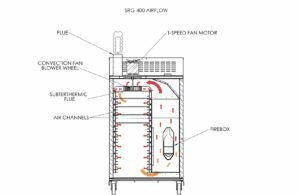 The patented airflow technology uses a fan in the top of the smoker to draw heat and smoke from the firebox into air channels that are on either side of the cooking chamber. These air channels have varying sized holes that create an even cooking environment. The heat and smoke from the cooking chamber is recycled back through the firebox chamber, maximizing temperature stability and smoker efficiency. The compact SRG-400 offers a 400lb capacity and fits through a standard 36” doorway as well as under a standard depth hood, allowing it to be placed in most any existing location. The removable rack slide system allows for infinite flexibility in spacing of product racks, accommodating up to 27 flat racks measuring 18”x 26” each at the minimum spacing of 1.5”, producing 87.75 square feet of cooking surface. The SRG-400 takes the guesswork out of smoking, easily adding smoked flavor to any menu. 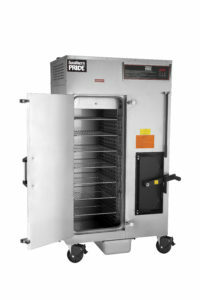 Standard stainless steel construction and easily removable components for cleaning ensure that the SRG-400 will meet the demands of busy commercial kitchens everywhere. 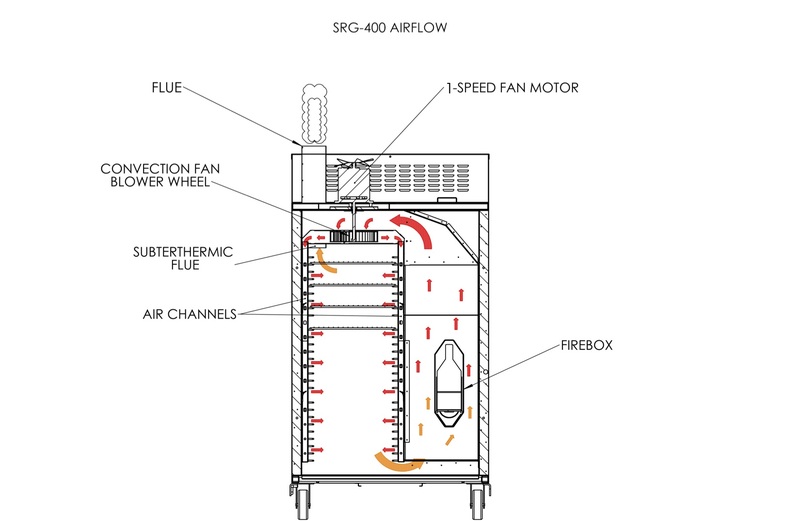 “The patented airflow technology in the SRG-400 is the next chapter in our storied 42 year history of manufacturing the best smokers for the most discerning pitmasters in the world” Shawn Odum, General Manager, Southern Pride. ABOUT SOUTHERN PRIDE Southern Pride was founded in 1976 when Mike Robertson and his father, B.B., hand built and marketed their first rotisserie smoker. Today, over 22,000 smokers later, Southern Pride fabricates and assembles every smoker by hand in their 117,000 square foot manufacturing facility in Alamo, TN.